Although Ayurveda can get a bit complicated at times, I always feel that it is best to keep things simple and stick to the basics. 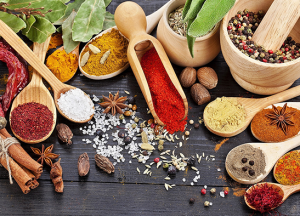 If you avoid getting lost in all of the information out there, you will discover that finding a healthy Ayurvedic diet doesn’t have to be overly tedious with endless lists of complex food rules and food charts. Although these can be helpful at times, they can also lead to excessive stress around food, over-analyzation and just utter confusion. In fact, the stress and frustration created by trying to follow anything to a tee (especially detailed food lists), can be as detrimental as some poor eating habits. These common dietary turmoils tend to produce paranoia and fear around eating as well. So for simplicity sake, let us go back a few notches and discover the basic dietary guidelines that we should try to keep to in our everyday life. No matter which dosha type you may be, these basic rules can apply to every-body of all ages and all levels of health. Although it is important to not be too strict when following guidelines, it is also important to not be too relaxed about it either. Just like everything in life we must find a healthy balance, knowing when our bodies need more disipline and when it may be alright to play around a bit. As a general rule, I always say that the stronger and more chronic the imbalance, the more diligent you should be during the healing process. So if you are ready to start a healthy, balanced Ayurvedic diet, here are some of the main guidelines to keep in mind. Once again, these rules can apply universally, no matter your dosha type. However, as you will see in number four, it will be important to know which dosha type(s) you may be and which dosha(s) is/are currently imbalanced. This will help you figure out some more specific guidelines to follow. Take our Discover your Dosha Quiz now! Whether we like it or not, our bodies crave and strive off of routine. This means that in order to find balance in our digestion, it is extremely vital that we are eating three meals daily, at proper times each day. Eating at routine times will provide our bodies the regularity to know when food is coming and therefore begin its necessary internal preparation before the food even comes. It also allows us to stabilize our energy, blood sugar and appetite levels, allowing us to make better decisions on our meal choices. Have you ever missed a meal, leading you to grab whatever foods were available at hand? This often leads to poor food choices, grazing and overeating. 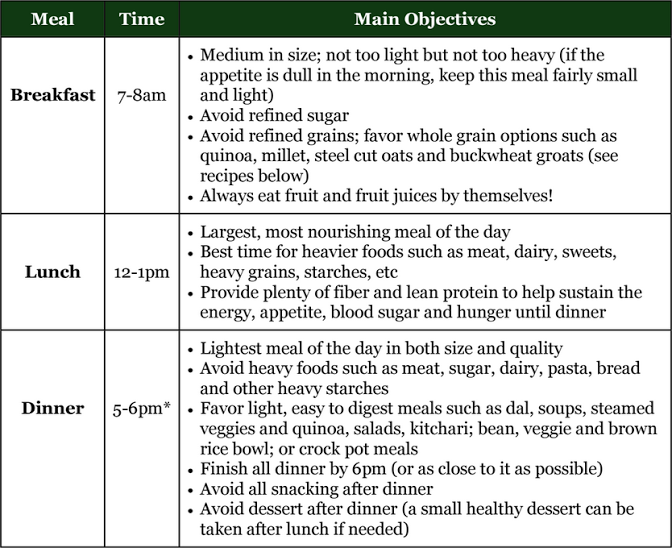 Here is a simple chart to keep in mind for healthy eating times. I also added in some general key points to remember in regards to each meal. *The dinner can be a bit later in the summer months if Kapha is not imbalanced. Continuing on from number one, skipping meals should always be avoided. This unhealthy habit often leads to an increase in Vata, a drop in blood sugar levels, decreased energy levels, a foggy mind, a sluggish digestion/metabolism, snacking, grazing, poor food choices and eventually overeating. If your current schedule is not allowing you to eat breakfast or take a lunch, I would make it a high priority to change your schedule. This is extremely important for our health, both body and mind. Not to mention your work performance and cognition levels will diminish when you do not have the proper fuel. Alternatively, your productiveness and efficiency will undoubtably increase by eating a healthy meal, at its proper time. This is another crucial recommendation when it comes to our digestive health. Often individuals come to me saying, “I do not understand. I eat healthy foods yet I am still suffering from many digestive issues.”. This is because it is not always what you are eating, but how you are eating it. One food may be healthy and easy to digest on its own, but when combined with certain foods may become “poison” to the body causing fermentation, gas, bloating, hyperacidity and toxic accumulation. Therefore it is imperative to look at your meals and make sure to avoid mixing improper food combinations as much as possible. Always eat fruit by itself. Eating fruit with ANYTHING else leads to indigestion and fermentation in the gut. Therefore fruit should only be eaten on its own. You can eat fruit either 30 minutes prior to a meal, or at least 2 hours after a meal. That means fruit is not a healthy dessert option, nor is it suggested to be eaten as a side dish. I know this is hard to hear, but you will feel better for it in the end! Only eat one protein per meal. Different proteins do not digest properly when mixed together. Proteins, especially meat, are already heavy and hard to digest, so adding the improper food combining will really lead to many digestive issues (and beyond). Make sure that each meal only contains one protein type. This means to eat cheese separate from meat, eggs without sausage and definitely no bacon-cheeseburgers. Do not mix starches with proteins. Since these two food types need completely different pH environments to digest properly, they are considered incompatible and should be eaten separately. This seems unheard of in the West with our steak and potato, rice and chicken, burger and bun mentality; so inevitably this will take a bit of getting used to for most individuals. 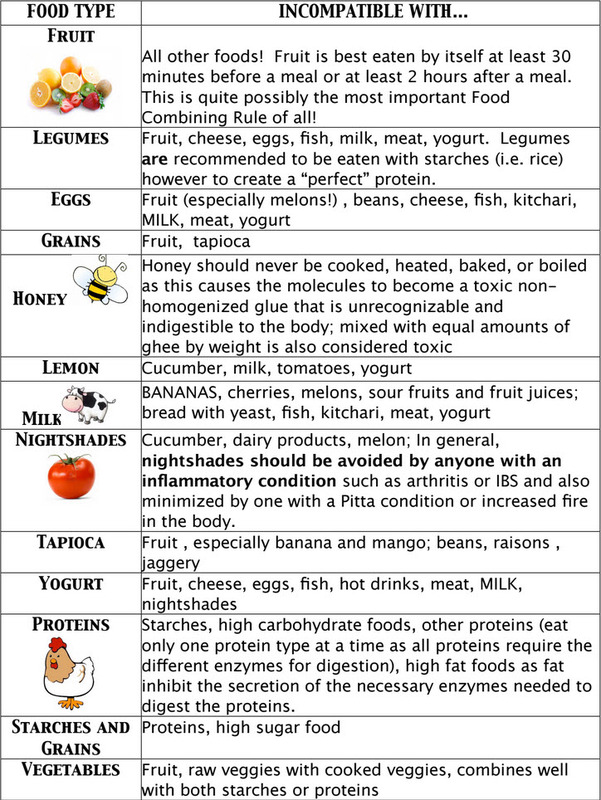 Click here for a printable PDF copy of the Improper Food Combining Chart. When it comes to healthy eating, it is not always what we eat, but how we eat. Ayurveda puts a strong emphasis on the fact that each and every meal (or snack) should be eaten sitting down, with great awareness. This means that we should not only avoid eating on the go (such as in the car or while walking), but even at our desks while working. In fact all electronics and distractions should be avoided while eating, including talking on the phone, playing on the computer, watching television, during a meeting or while in heavy conversation. Instead, taking the time to find a quite space to sit down, giving focus on chewing each bite and taking in all of the tastes that go with it. This will not only be useful to allow your body to focus on digesting the food properly, but also it will give you the capacity to avoid mindless eating habits and to become aware when you are truly full (before it is too late). If you know your dosha type, or at least which dosha is currently out-of-whack, you should make it a high priority to follow their respective basic food guidelines accordingly. For instance, this means that Vata types ideally will avoid cold, raw foods; Pitta types should avoid hot, spicy and inflammatory foods; and Kapha types should avoid heavy, sticky foods like dairy and gluten. Once again, you can be eating perfectly healthy foods; however, they may not be healthy for your individual needs and therefore will cause disruption in the system. Click here to discover your Dosha Type! No matter what your dosha type may be, it is always important to eat with the season. This can also help if you have multiple doshas that are predominant or more than one dosha imbalanced at any given time. To eat with the season can have a couple meanings. First, it is always best to eat seasonally fresh (and ideally local) produce. For instance berries are at their peak in the summer months, but may be lacking in both taste and nutrients when you eat them in the wintertime; instead favor stewed apples and fresh citrus during the Fall and Winter seasons. Second, it is also essential to eat warming foods in the cold months and favor cooling foods in the hotter months. For example, in the winter you should favor hot soups with lots of warming spices and well-cooked root vegetables; while in the summer this may be too heavy and heating. Instead try adding some cooling foods to your meals such as cilantro, coconut oil, cucumber, bitter greens, lime and ghee. Basically, by eating intelligently with the season you will naturally be helping to keep you and your doshas in balance. This is another recommendation of great importance. Although you probably already heard this many times, it is truly crucial to avoid eating food late at night. The exact time to finish eating may vary slightly, but as a general rule I would recommend to end all food intake by 6-630pm*. Our bodies and our metabolism are naturally slowing down each evening, typically around the same time as the sun is setting. Therefore whatever we put in our bodies at this time will have a much slower transit time when traveling from the stomach to the colon. This is further impeded by our sedentary nature after dinner, giving little movement and space for proper digestion. With longer transit times mixed with sleep coming soon, this sets up a stage for any late night foods to simply sit in the gut until morning. This leads to a groggy awakening, dull morning appetite, sluggish digestion and eventually toxic accumulation. *This time may be a bit earlier in the dark winter months, but a bit later for the summer. Although having a small, healthy snack (i.e. a piece of fruit, a cup of yogurt, OR a handful of nuts) in between meals may be recommended for some individuals (generally Pitta and Vata types), grazing or taking in multiple snacks should always be avoided. This is because eating (even small amounts) too frequently causes your digestive fire (Agni) to be at work continuously throughout the day. This overtaxes the Agni, as well as the pancreas and leads to sluggish digestion and toxic accumulation. On top of this overwork that occurs, often many food combining rules will be broken when grazing, making all of these negative effects even more heightened. So stick to your three meals each day, taking in lots of fiber and lean protein, making snacking unnecessary. If you are already suffering from digestive woes, a common Ayurvedic practice is to prep the fire with a stimulating digestive appetizer before each meal. This can be something as simple as ginger tea with honey, or something a bit more powerful like our Agni Elixir. Depending on your digestive needs, these can be taken up to three times daily, 30 minutes (or less) prior to eating. Click here for our ginger, lime and honey appetizer recipe! An impaired digestion is the root cause all disease!